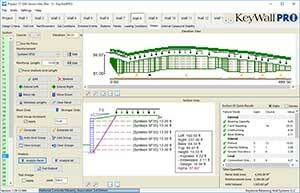 Keystone Retaining Wall Systems launched KeyWallPRO, an updated version of its KeyWall software tool for design professionals. KeyWallPRO is an advanced software that provides design and analysis for gravity walls and soil-reinforced wall sections for all Keystone structural units and most common soil reinforcement materials, according to the company. The new software combines popular features from existing Keystone KeyWall and KeyDraw software tools. In addition to providing full wall layouts and updated design sections with quantity estimates, the updated version supports pinned, lipped and lugged products across the full line of Keystone Retaining Wall Systems and Keystone Hardscapes structural walls. It’s available to download on two registered computers for a one-time fee of $9.99 that includes free future software updates.